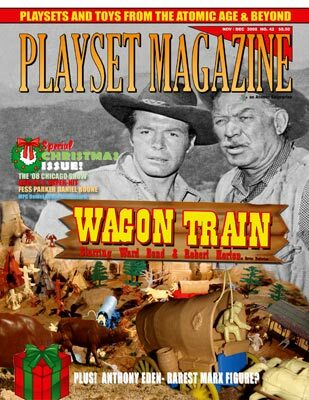 So now for issue 42 we bring you the Complete Guide of Wagon Train, starting in 1958 and going all the way through the 1962 sets with a whopper centerspread to delight the Christmas kid in you. You'll see the Mooing Cow, the Buffalo, the rare and not so rare wagon variations, the boxes, and solve a mystery or two. And we are pleased to announce a BRAND NEW Wagon Train set discovery, just before we went to publication, with confirmation from a second set. This issue is definitely one for the books, folks! Also in this issue is the annual Old Toy Soldier show in Chicago. You'll see new friends and old, and glimpse some of the many sets for sale there. And why not? It's the largest gathering of plastics collectors at one time in all the world! You'll also enjoy the great lost, and very rare, historical figure of Anthony Eden, courtesy Mark Hegeman. Other stories include the West Virginia Convention, dioramas, several pages of news, Kent Sprecher's report on the Empire White House, a Daniel Boone set beats records on Ebay, and then one of the big events for us is the debut premiere of several new playsets --- and this one is a brand new spectacular and you'll want to get our take on it -- Barzso's new, official and licensed Fess Parker Daniel Boone spectacular playsets! That's right, plural because there's a great new fort as well as the entire village of Boonesborough! Plus there's a new Fortified Abbey, more classifieds, and lots of ads to find that perfect vintage or new-era production playset addition to your collection! We've been working up a big surprize for the January issue and we hope you'll find it as delightful as we do worjking on it. Hint: if you can think of a figure that illustrates the Far Horizons, Agony and the Ectasy or El Cid, phtotgraph it and send it in! So with all that, we hope your Christmas season is a warm and fabulous one and that Santa finds your house okay! God bless and see you after the new year!